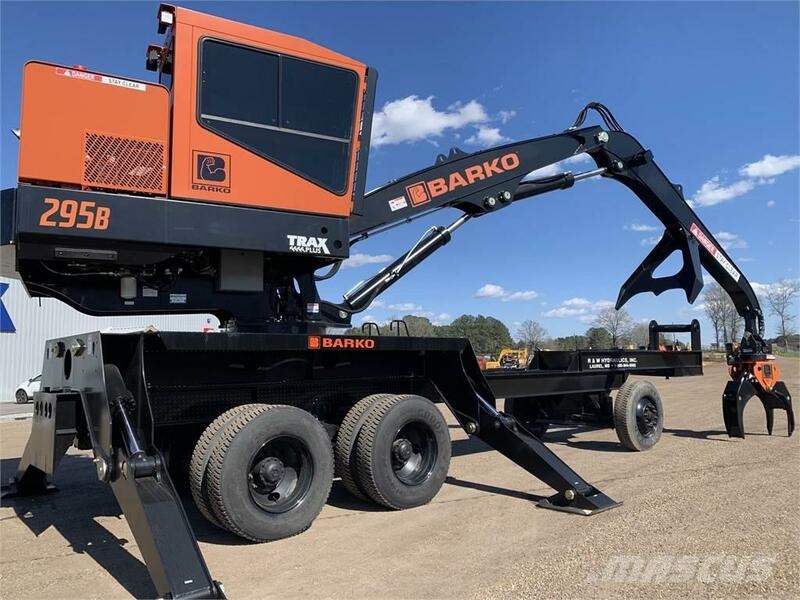 Autres informations Description: The Barko 295B RTC packs ample power into a compact package, while pilot operated controls and enhanced serviceability contribute to exceptional operating efficiency. The Rough Terrain Carrier is built with a rigid frame that provides far more stability than articulated carriers, allowing operators to maneuver safely without sacrificing performance. The RTC delivers extraordinary drawbar pull of 21,000 pounds, enough to pull a small log trailer, easily move through mud, and even climb steep grades of up to 45-percent. 4-wheel, 2-wheel and crab steering capabilities allow for effective maneuvering in tight spaces. With all four wheels maintaining ground contact to provide proper support, the RTC can easily navigate from pile to pile to maximize efficiency. Using 4-wheel-steer, the machine's 18-foot turning radius is sharper than many half-ton pickup trucks. With ability to travel up to 12 mph in high gear, the RTC won't drain your productivity every time you have to move across the yard. The 295B is powered by a 173-HP Cummins QSB6.7 Tier 4 diesel engine with SCR aftertreatment. Standard 3,000-pound cast steel counterweight provides extra stability. Vibration-isolated "floating cab" provides a smoother ride. Weather sealed, insulated and climate controlled, the cab includes a suspension seat with armrests, foot swing controls, swing out entry door, front guard and halogen lights. Walk-up steps and a solid platform minimize the potential for slip-and-falls when entering the cab. Tinted windows, including roof, rear and sliding side windows, provide 360-degree visibility for safer operation. Sur Mascus France, vous pouvez trouver un/une autre Barko 295B RTC. Le prix de ce/cette Barko 295B RTC est de - et il a été fabriqué en 2018. Cette machine est visible sur Hickory, Mississippi en/au États-Unis. Sur Mascus France, retrouvez des Barko 295B RTC et bien plus de modèles de autre.